Mercedes-Benz is a unique car company producing luxury vehicles across all models. Whether you’re in the market for a family car, a convertible or a pick-up truck, read on to learn how they group their high-end cars into classes and models. 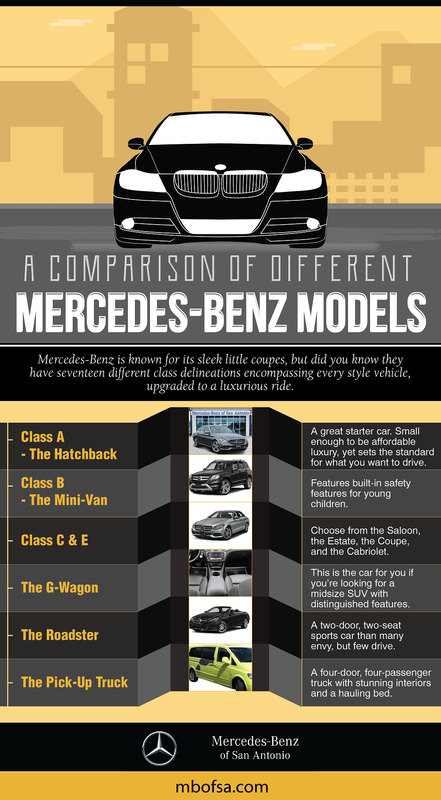 Mercedes-Benz is known for its sleek little coupes, but did you know they have seventeen different class delineations encompassing every style vehicle, upgraded to a luxurious ride. When you notice a Mercedes-Benz pass you on the highway, chances are it’s from one of these classes. They’re contain the most popular models for individuals, couples and young families. A great starter car. Small enough to be affordable luxury, yet sets the standard for what you want to drive. Referred to as a “multi-purpose vehicle”, this van is perfect for a growing family, featuring all the built-in safety features for young children. These classes feature a well-designed group of luxury compact cars for the executive and business savvy. Choose from the Saloon, the Estate, the Coupe, and the Cabriolet. With the latter you can even ride convertible style! This is the car for you if you’re looking for a midsize SUV with distinguished features. This car’s initials have a well-known reputation. To drive a GT-class is pure excellence. A two-door, two-seat sports car than many envy, but few drive. Truck drivers, elevate yourself to a luxury ride while maintaining the practical side of owning a truck. A four-door, four-passenger truck with stunning interiors and a hauling bed. When you’re ready to drive in style, choose a Mercedes-Benz. Quality meets high-end luxury in every one of the models, regardless of the class it’s assigned to. When you choose Mercedes-Benz of San Antonio, the sales staff pay attention to details. Their goal is to match you with the right car for your life. Visit their website at https://www.mbofsa.com/, to look inside each car at their exquisite interiors. Read through the number of recent upgrades and new technology installed in many models. When you’re ready for the test-drive of your life, call (210)-920-3237 to schedule a visit to the showroom at Mercedes-Benz of Antonio, Texas. Drive luxury, because you deserve it.